I usually don't like books with an abundance of quirky characters. I usually don't like books set in quaint and cutesy small towns. I usually don't like books narrated in first person by wordy 11-year-olds. 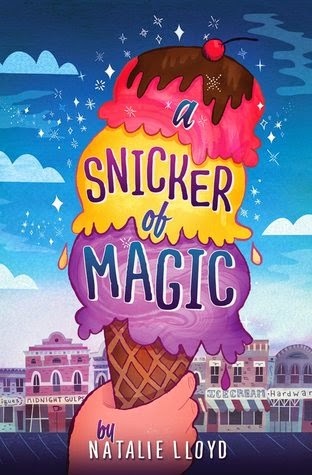 But in spite of all of that (or maybe, just maybe, because of it), I loved A Snicker of Magic. The moon is full the night Felicity Pickle and her mother and sister arrive in Midnight Gulch, Tennessee. Felicity is so tired of new beginnings (and it seems like her mother is addicted to them), but she is hoping that Midnight Gulch will finally be the place they can call home. It has a few things going for it: it's the town where her mother grew up (and where her Aunt Cleo still lives); it used to be full of magic (and still seems to have "a snicker of magic" flowing through it); and it's the home of the Beedle (who soon becomes Felicity's best friend). As for Felicity, she is a girl who loves words. And she sees them everywhere she looks: suspended in the air, slithering across the floor, popping out of nowhere. They take on shapes and colors and give her glimpses into the mind and heart of those around her. In a fit of desperation to keep her mother still for a couple more weeks, Felicity signs up to share her words with the whole town at the Duel (a talent show of sorts). She is scared out of her mind, but as she learns more about the history of the town, she thinks this might be the way to free her family of the century-old curse they seem to be prisoners to. In the weeks since I finished this book, I've pondered why I liked it so much. It was kind of a cross between The Center of Everything (which features a donut-obsessed town and Ruby's fear of reading her essay in front of a bunch of people) and Savvy (where Mibs and her family have certain magical gifts). In this case, the town is ice cream--not donut--obsessed; similar to Ruby, Felicity is afraid to share her words; and instead of a family with supernatural powers, there are a number of characters with certain unusual gifts or talents. But where it definitely didn't work for me in The Center of Everything or Savvy, something clicked here. And I can't figure out why. Maybe I felt a certain connection with some of those quirky characters. Or maybe it was because I found their quirkiness absolutely endearing (Jewell Pickett's Lube & Dye; Rosie Walker's cowboy boots; Day Grissom's gnarly beard; Boone Harness's banjo). Maybe the wide assortment of ice cream flavors (Blackberry Sunrise, Chocolate Orange Switcheroo, Chocolate Chip Pork Rind) were just more novel to me than donuts. Maybe it was the element of mystery that threaded its way through the entire story. Or maybe I liked the link to history and the past. Maybe it had to do with the fact that Felicity wasn't just trying to help herself but also her mother and Florentine and everyone else who'd been affected by the events of the past. Maybe it was because even though the ending was very satisfying, it wasn't perfect. Or maybe something about me is different. Maybe I've changed. Maybe I'm less cynical. Maybe I'm more willing to believe in "a snicker of magic." For whatever the reason, I was completely smitten with Felicity's story. It has received some early Newbery attention (Betsy Bird of A Fuse #8 Production predicted it to be "the most divisive book of 2014"), and I personally would not be one bit disappointed to see it receive a little Newbery love. That said, I can understand why everyone might not love it. Quite frankly, I'm still surprised by how much I enjoyed it, and a part of me wants to read it again to see if it was just some weird sort of fluke. But love it, I did. And admit it, I will.